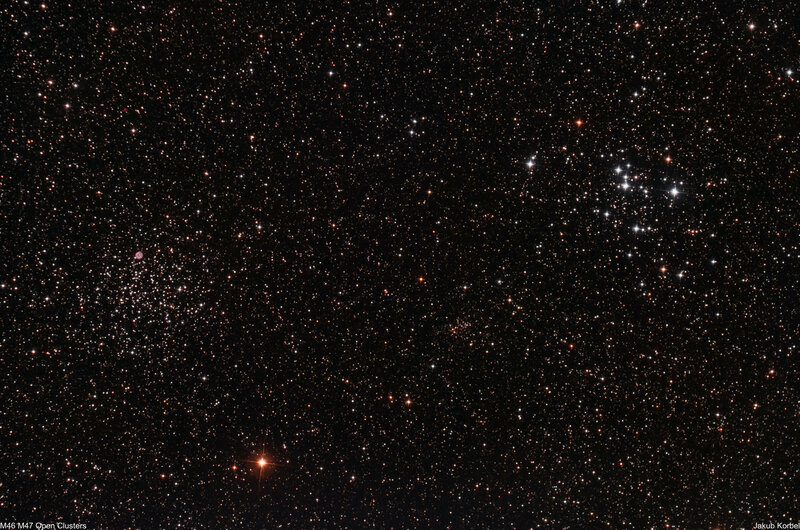 Messier 46 (left) and Messier 47 are open clusters located in constellation Puppis. Visually, these clusters are quite close to each other and both fit in the field of view of my smallest telescope. Visual distance is not the real distance, because M46 in approximately 5000 light-years away and M47 is much closer, only 1600 light-years away. M46 contains roughly 500 members and small planetary nebula called NGC2438 can be found there. The picture is a stack of 22 pictures, 2 minutes exposure each, which means 44 minutes in total. Unfortunately, my telescope was not properly collimated, therefore the stars are elongated in the upper left corner. Well, I must say that this was the first and the last night in January without clouds, therefore I did not get the chance to recapture this deep space object.